Port Moresby is the nation's Capital and nerve center for government and commerce. Port Moresby is in itself a microcosm of Papua New Guinea, catering for about 200,000 people consisting of a large number of non-citizens, as well as 800 diverse languages and cultures. Moresby fluctuates from the hustle of commercialisation to the serenity of a country town. Downtown at the waterside is the nostalgic Moresby, of narrow streets and historical street signs. At the entrance of Fairfax harbor lies Lolorua and Fishermens' Island, favorite picnic areas for sailors. Beautiful views from Paga Point overlook Ela Beach and Koki Bay. Juxtaposed to the metropolis is the partly stilt-based Hanuabada Village, home of the traditional Motuan landowners of Moresby. Burnt after WW2, the big village was rebuilt by the Australian Administration. Despite cosmetic changes, the character of the village is still there and it is renowned for its elaborate and expensive bridal ceremonies. Koki market down at the waterfront is a favorite for trade in seafood brought in daily by local fishermen. Here you'll also find lots of fresh vegetables and fruits for sale. There's a pleasant informality about dress in Moresby and casual clothes and open neck shirts for men are worn throughout the year, along with the traditional clothes such as rami, sulus, laplaps and kolos. Blending the new and the old, the National Parliament, a symbol of modern architecture, contrasts with the dignity of traditional design at The National Museum and Art Gallery. Well worth a visit is the National Museum and Art Gallery which began its first permanent display of local cultural artifacts in late 1978. It is located on the slopes of Independence Hill at Waigani and is open weekdays and Sunday afternoons. It is not recommended trying to do independent touring in Port Morsby. The country itself is breathtaking with the mountains and forrests however it is NOT safe. Papua New Guinea is a strange place when it comes to travel. The tropical conditions, fierce geography, and lack of government capacity means there are very few paved roads in the country. 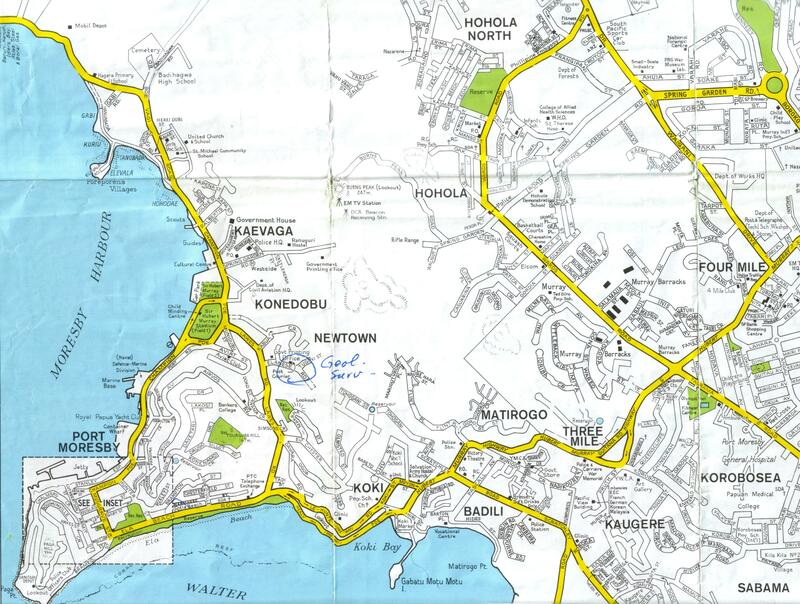 With the exception of a brief span of road connecting it to the immediate hinterland, there are no major roads linking Port Moresby to any other city. On the north coast, a tenuous highway theoretically runs from Madang to Wewak.